Reading the headlines about the "homeless doll" by American Girl, I was as struck as anyone else. Imagine: $95 for a homeless doll. But after digging around on the American Girl site I decided it wasn't such a stupid idea after all. "Gwen," the so-called "homeless" doll, is the friend of a new doll, Chrissa, whose story is that she moves in with her grandmother and experiences the cold shoulder by the "mean girls" at her new school. But she makes two fast friends, one of them being Gwen, who fell on hard times when her family lost their house to foreclosure and was then abandoned by the father. The girl lived with her mother in a car for awhile, until winter weather got them to a shelter. From there they were eventually able to get back on their feet and into an apartment. Why is this not a valuable story for a girl to read? It's happening, to varying degrees, all over the country. Yes, yes, I get the irony of a "poor girl" doll that costs nearly $100. No girl whose family is actually in those dire straights is about to buy such a pricey toy. 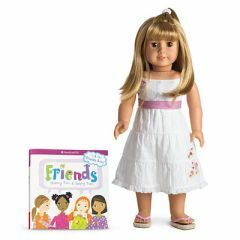 (I also note with amusement that this particular doll doesn't come with a trove of clothes and accessories like all the other American Girl Dolls do. Probably for good reason it's only available for a "limited" time...it's not a cost leader). Still, I don't think the outrage over this costly "homeless" doll is warranted. I don't know how many girls really get into the story of their dolls, but I do know many of them love the books. If just some of the middle and upper-middle class girls who get these dolls pick up the idea that hard times can fall on anyone, then it's a good lesson learned isn't it? At the very least it can spark some worthwhile family discussions about the economy, finances, and what can happen if you don't manage them wisely. What do you think? Would you buy a Gwen American Girl Doll for your daughter or grandchild?